GET NOTIFIED OF DEALS UP TO 40% OFF! What are you waiting for? Subscribe Now! Delivering vapor clouds that are quite literally, out of this world, the Crafty vaporizer has earned the “best top 5 vaporizers” title , and rightfully so! Even the biggest of vaping critics will be blown away by the bountiful vapor produced by the Crafty, thanks to extremely low draw resistance and a highly innovative blended heating system. 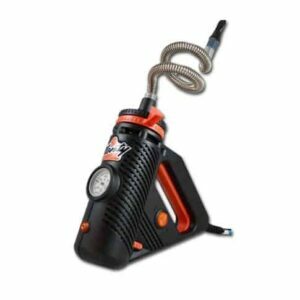 Storz & Bickel really outdid themselves with the new and improved Crafty Vaporizer, and they are already making waves in the dry herb vaporizer industry! 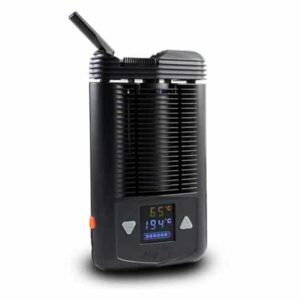 The new Crafty has been categorized in the group of “most discreet” vaporizers, and with a weigh in of only 0.3 lbs with a stature of just 4.3 inches in height, it’s topping the charts in that category! Manufactured by the makers of the famous “Volcano Vaporizer”, you can rest easy knowing that the Crafty was engineered with the same premium components. Simplicity is the name of the game here, with the single-button control, and just one key press. Oh and let’s not forget, the Crafty includes 1 powerful Lithium-Ion battery, so you can be sure you’ve got enough juice for some serious vaping! With simplicity in mind, the Crafty’s small stature was engineered with a single-button control mechanism, and with just 1 touch your vaporizer will be away to the races! If you like “speed” get ready to be impressed. With the rapid heat up time boasted by the Crafty, you’ll be at the default vaping temperature of 365F in just 60-90 seconds. For most full-bodied vapor, just 1 more click on the button will increase your temp to 383F. No need for thumb twiddling while you wait on your vaporizer either thanks to the innovative vibration feature which lets you know when the desired temp has been reached! To top that off, the Crafty also features an LED indicator light, which will automatically change to green when it’s time to vape! Conduction and hot air convection were already combined in the Mighty Plenty and the Volcano, and the new Crafty is no exception. What is the purpose and how does this work? You’ll enjoy immediate, non-stop vaping as a result of the convection heating component, but you can also be sure you’re going to have vapor from the first pull thanks to conduction! Simply fill up the chamber using the filling aid included, and attach the cooling mechanism with mouthpiece and you’ll be set for one heck of a vaping session! The Crafty’s design was engineered to include the cooling unit so the vapor can be cooled down (makes sense), but also to ensure superior flavor with a delicious aroma! In today’s day and age, our smartphones are becoming a necessity, and we are able to control virtually anything with a simple download! Now, with the free Crafty App, for iPhone 4s or higher, and Android 4.3 or higher, you have the ability to customize default and boost temp settings for your vaporizer to suit your needs! Now you can check your battery life, turn your vibrate feature on or off, and set an alarm and notification alert for your phone and MUCH more using the Crafty App! How can you get set up…?? Using either the iPhone App Store or the Google Play Store, just download “Crafty Remote App” and you’ll be vaping to hearts content as easy as 1…2…3! Great service, amazing deal and fantastic German vape. Keep up the good work guys. After a long research and asking may questions, I went with the Crafty and man am I ever happy with my purchase. Thank you for putting up with me and answering all my silly questions guys. I was torn between convection or conduction heating method, I had a Pax2 before and when my order arrived I couldn’t believe the difference between the 2 units. I really appreciate your assistance and making this decision simple for me. Delivered faster than expected. Thank you! Professional service, great prices and quick delivery on excellent product, even came with some bonus cleaning tools…what more could you ask for? Awesome vape! Frequent cleaning required so I recommend getting extra parts. If anyone is considering getting the crafty, do it. Best price I found online in Canada, very fast shipping and excellent customer service! Tools420 is the best. Vape is amazing but battery life hurts. I just got this and have only used it twice today but I was really impressed! Great clouds. I like it better than my Pax2 for sure!! Bought in the Burlington store, great service and very helpful!! 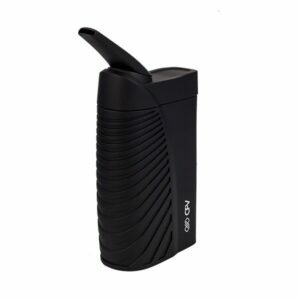 I love this vaporizer. I use it for medical purposes. The customizable temperature allows me to get the most out of my herb. This was also the best price I have seen anywhere. I will be getting another one soon so I can rotate their use. So far so good excellent for clean full vape experience, you can change the temperature easily through the phone app to you desired liking. Lower temperature makes for a full flavourful taste experience of your flowers. Makes a great toke but the battery is pretty weak. Mine is brand new , it gets hot at the base while charging and lasts for three sessions . I’d go with the mega next time.